Dubai: The Mohammad Bin Rashid Space Centre (MBRSC) announced on Friday that it had selected Hazza Al Mansouri as the prime astronaut for September 25th’s eight-day mission to the International Space Station (ISS) - in an announcement that will make him the first Emirati in space and the first Arab aboard the ISS. 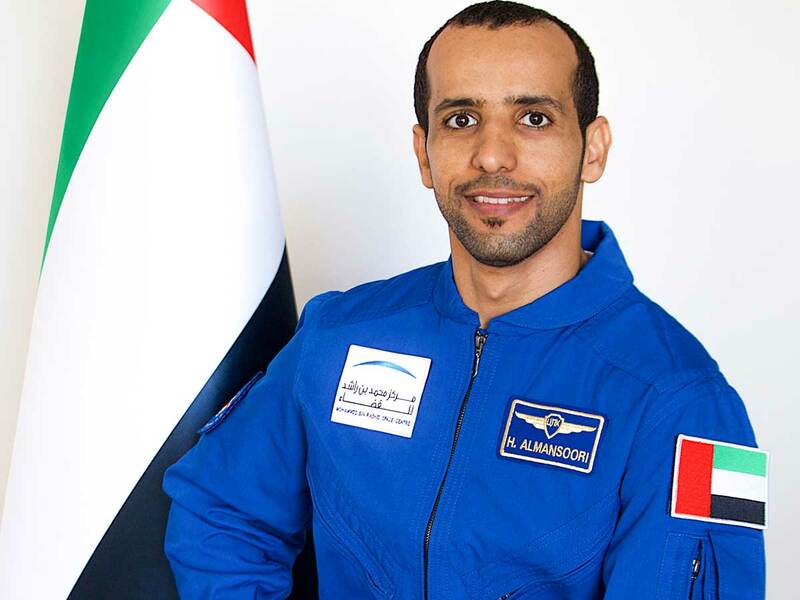 Al Mansouri had been one of two short-listed for high level training at the Yuri Gagarin Cosmonaut Training Centre in Star City, Russia in preparation for this mission along with Sultan Al Neyadi, however Al Neyadi will now become the backup astronaut for this mission. A Soyuz-MS 15 spacecraft from the Baikonur Cosmodrome in Kazakhstan will transport Al Mansouri into space on September 25 and he will return to earth aboard a Soyuz-MS 12 on October 3 with his name in the history books. Yousuf Hamad Al Shaibani, Director General of MBRSC, stressed that this announcement is a major step towards achieving the objectives of the UAE Astronaut Programme to train and prepare a team of Emiratis to be sent to space for various scientific missions. The programme was announced by His Highness Shaikh Mohammad Bin Rashid Al Maktoum, Vice-President and Prime Minister of the UAE and Ruler of Dubai, and His Highness Shaikh Mohammad Bin Zayed Al Nahyan, Crown Prince of Abu Dhabi and Deputy Supreme Commander of the UAE Armed Forces, in 2017. Al Shaibani highlighted that Al Mansouri and Al Neyadi are positive role models for Emirati youth. The two astronauts will inspire the country’s youth to follow in their footsteps by utilising the resources provided by the UAE leadership, motivate younger generations to explore and innovate, and help prepare generations of Emiratis to contribute to enhancing the UAE’s status in space science and research, as part of the UAE’s plans and programmes in the space sector and its ambitious aspirations to transform itself into a knowledge-based economy. Salem Al Marri, Assistant Director General for Science and Technology Sector and Head of the UAE Astronaut Programme, said that the advanced levels of proficiency achieved by Al Mansouri and Al Neyadi shows that Emirati youth have the determination and ambition to succeed in all fields. He highlighted that MBRSC continues to invest in Emirati youth to push this sector forward. “Al Mansouri and Al Neyadi are both undergoing the training to ensure that they are ready to travel to the ISS. Al Mansouri is undergoing his training with the prime team, while Al Neyadi is undergoing his training with the backup team. Each team consists of three astronauts,” added Al Marri. Al Marri further said that Al Mansouri will be the first Arab astronaut to travel to the ISS; he will be presenting a tour inside the ISS in Arabic, in which he will explain the components of the station and the equipment on board. He will also be conducting earth observation and imaging experiences, interacting with ground stations, sharing information, as well as documenting the daily lives of astronauts at the station. During his stay on the ISS, Al Mansouri will undertake a scientific mission to study the impact of microgravity in comparison with that of gravity on Earth. This mission includes 15 experiments that will be selected based on MBRSC’s ‘Science in Space’ competition, which targets schools in the UAE. Moreover, the reaction of vital indicators of the human body will be studied before and after the trip to compare with Earth results. This is the first time this kind of research will be done on an astronaut from the Arab region. The results of this study will later be compared with research conducted on astronauts from other regions. Furthermore, Al Mansoori will be assigned to complete existing scientific missions at ISS laboratories. Al Mansouri is a Functional Check Flight (FCF) Pilot F-16B60. He graduated from the Khalifa Bin Zayed Air College, which qualified him to become an F-16B60 instructor pilot and a demo pilot, SOLO Demonstration pilot in F-16B60. He was one of the first Arab and Emirati pilots to take part in the Dubai Air Show’s celebrations of the 50th anniversary of UAE Armed Forces. He also presented a show on the UAE National Day 2017 and the 50th anniversary of UAE Air Force 2018. Al Neyadi holds a PhD in Information Technology (Data Leakage Prevention). He worked as Network Security Engineer for the UAE Armed Forces before joining the UAE Astronaut Programme. Al Mansouri and Al Neyadi were selected from 4,022 applicants to the UAE Astronaut Programme after a series of advanced medical and psychological tests as well as personal interviews conducted according to the highest international standards. The UAE Astronaut Programme is funded by the ICT fund of the TRA. Launched in 2007, the fund, which is the first of its kind in the Arab world, aims to support research and development within the ICT sector in the UAE and help it grow into a nationally significant industry that occupies a leading place in the world.